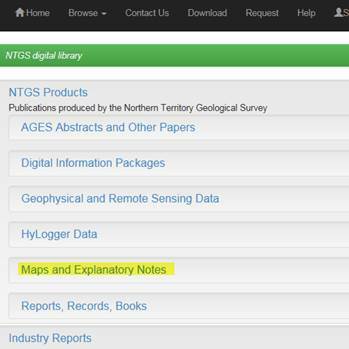 Geoscience Exploration and Mining Information System (GEMIS) is an online database for accessing geoscientific reports and data kept by the Northern Territory Geological Survey (NTGS). Content is organised hierarchically within communities, subcommunities and collections. Additional collections will be added as content is prepared. Information about each of the six product collections is available on the each of the collection home pages. MEX contains open file minerals exploration industry reports and data submitted to the Northern Territory Government as a statutory requirement of tenure held under the Mineral Titles Act. Petroleum Wells contain Northern Territory onshore open file well completion reports and associated data submitted to the Northern Territory Government as a statutory requirement of tenure held under the Petroleum Act. Petroleum Geophysical Surveys contain Northern Territory onshore open file seismic and other geophysical survey reports and data submitted to the Northern Territory Government as a statutory requirement of tenure held under the Petroleum Act. Core Sampling Reports collection contains reports and data from studies done on drill core and cuttings samples held in the NTGS core libraries. They are submitted to NTGS as a condition of sampling by external government agencies, industry and universities. 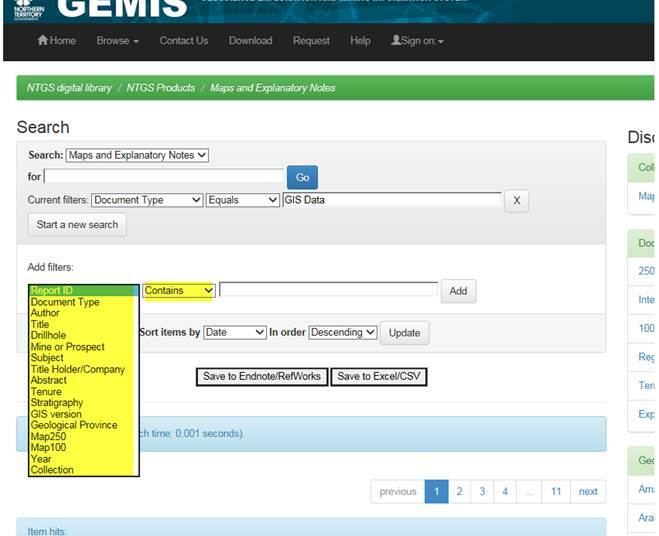 The following sections describe how to search using the built in GEMIS functions. The database and document contents are also indexed by web search engines, such as Google, Yahoo and other web based search tools. Browse allows you to scroll through lists of terms in alphabetical order. There is no option for further filtering therefore browse is best used where search results are few or if you are unsure of what terms to search for. The following table lists the fields available for browsing. Some fields are not relevant to all collections. For example, the drillhole list does not include names of drillholes in the mineral exploration reports. Corporate Author : The organisation/s responsible for writing the report. Mine or Prospect : Mine or prospect name used by title holder. Bottom Hole Formation : Petroleum wells bottom hole formation as identified in well completion report. Start with any term in the quick search box or begin searching by selecting a collection on the home page. 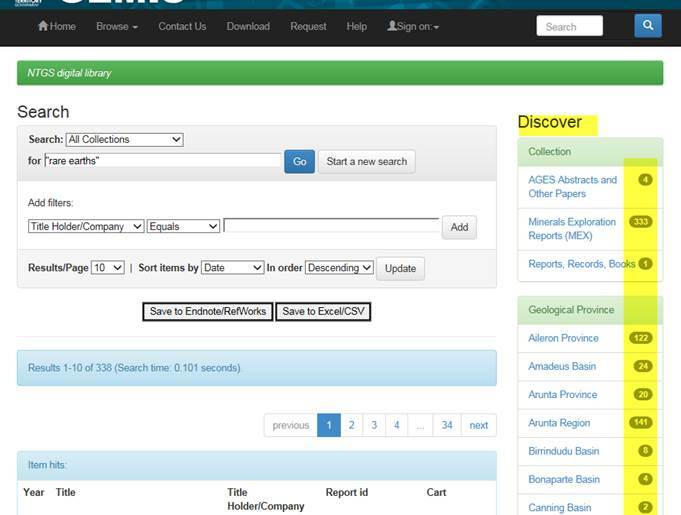 Type any keyword or keywords to search all metadata fields and full text of reports at the same time. Use Discover menus to filter search results. 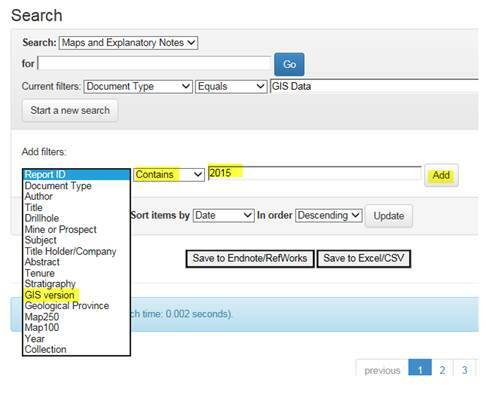 Refine search results by using additional terms from Discover menus or by adding field filters in the search box. 2. Use Discover menu to filter maps with GIS data. 3. Add filter GIS version, Contains, 2015 by using drop down menus and clicking Add. More than one word will default to a phrase search (it uses the Boolean AND between words). For example, if you type ‘Lake Mackay’ without quotation marks in the search box, it will appear as “Lake Mackay” and will only find items with the phrase ‘Lake Mackay’. The search engine automatically expands words starting with the search term. For example ‘drill’ will retrieve records containing the words: drill, drilling, drillers, drilled etc. eg Robinson River 250k map was published in 2002. A GIS version of the 2002 map boundaries was released on 27/11/2015 2015. From the Search Results list, click on the report title for more information about the report and to view attached files. Use your browser back button to return to search results from the document details page. The Search Results list indicates how many files in a report are available for download. Click on "Add to cart" link if you know that you want all the available files. Click on the report title for more information about the report and to view a list of files available for download. Individual files can be selected for download. Files from multiple reports can be added to one download cart. Contents of the download cart are listed on the download page for further refinement. There is an option to download either from the browser window as a zipped folder or by using a java applet. The download cart will remain populated between visits if you do not click “Download Selected”, but will automatically empty after you have downloaded files. Scanned copies of reports originally submitted in hardcopy are being progressively added to the downloadable database. If a report or data is not available for download, you can submit a request for a copy to be sent to you either by e-mail or on storage media in the mail (dependent on the data volume). Multiple reports can be added to one request cart. The request cart will remain populated between visits, but will automatically empty once you have clicked 'Send'. Once you have sent your request to NTGS, you will receive an e-mail request receipt with a tracking number. NTGS will not mail copies of reports or data that are available for download unless there are exceptional circumstances. 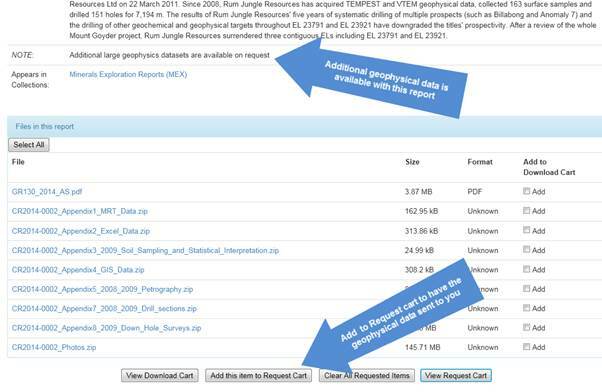 Geophysical survey datasets and other data types over 1GB are not currently available for download from GEMIS. Such data can be obtained by submitting an order via the Request Cart. Seismic field data is supplied as a basin package on portable hard drive. Copying and handling charges apply. All other large datasets are supplied free of charge, however you may be required to supply your own portable hard drive for requests exceeding 34GB. 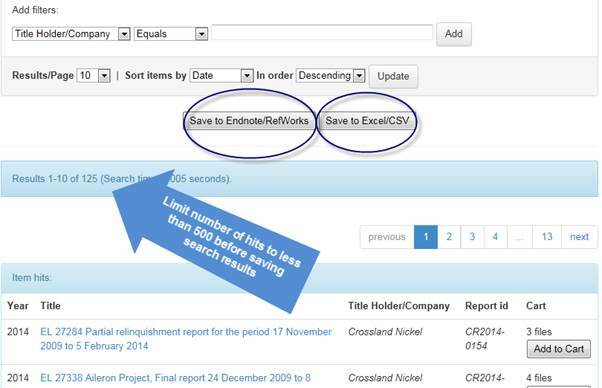 The Search Results screen allows you download the list of reports in either excel/csv or Endnote/Refworks format. More than 500 search hits will not save correctly. Refine your search to obtain less than 500 results before saving a list. Search results obtained by using a Discover filter may not save correctly. A fix for this bug is in development. Meanwhile, searches using the quick search and “add filters” function can be saved. There are permanent links (URI) for individual reports which can be cited or e-mailed allowing for downloading later. From the collection home pages, you can subscribe for e-mail notification when additional reports or data become available. New data can be either newly released open file reports (legislated public release industry reports) or newly scanned material or newly released/updated NTGS products. RSS - is an alternative to email updates if you prefer notification of reports added to GEMIS via a browser or mobile device RSS reader. My GEMIS allows you to add or cancel your e-mail alerts. Receive e-mail updates is an alternative to subscribing from the collection home page. Edit profile allows you to manage your contact details and password. Passwords are case sensitive.